Started playing golf at 10 years of age. 2nd Connacht Close – Oughterard G.C. Senior Cup for Tuam Golf Club. Connacht Under 15 Interprovincial at Castlewarden Golf Club (2 out of 3 points). Jimmy Bruen for Tuam Golf Club with Paul Burke – reached Provincial Final at Strandhill GC. Irish Boys – Under 16. First sfter Round 1. Finished 5th overall at Heath GC. Connacht Under 18 at Roscommon GC. Finished 10th. Ulster Boys – Under 16 at Dungannon Golf Club – Finished 10th. Won Junior Scratch Cup at Castlebar Golf Club. Won Connacht Under 16 Order of Merit. Connacht Under 15 Interprovincial at Athlone Golf Club (2 out of 3 points). Qualified for Final Round of Irish Boys at Tuam Golf Club. Won by Adrien Pendaries (France). 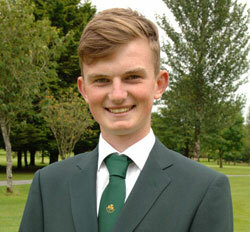 Selected for Irish Team for Cardigan Cup at Cardigan G.C. Wales – won 3 out of 3 matches. Played in Henry Cooper Masters at Nizels G.C. in Kent UK. Played for Connacht Boys Under 18 in Interprovincials. 2nd highest points scored with 4 out of 6 pts. 9th in Connacht Boys in Galway G.C. 10th in Munster Boys in Dromoland G.C. 2nd in Ulster Boys in Bangor G.C. 20th in Leinster Boys in Mullingar G.C.